One of the best in the market, the Ram Promaster City remains an excellent choice for those looking for a smaller, more city-friendly commercial cargo van. Featuring best-in class cargo capacity, a smart and business-forward design, with exceptional driving capabilities, you’ll feel confident knowing the Promaster City can carry and handle whatever the job needs you to bring. Interested in learning more? Great West Chrysler is your go-to dealership in Edmonton for getting you started on your journey. Read on to see why the 2018 version of the Ram Promaster City is the perfect choice to drive your business forward. 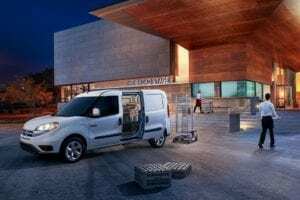 Part of what makes the 2018 Promaster City excel as a commercial van is it’s incredibly large interior, poised to become the most useful part of this vehicle. Combined with the 51.6-inch tall roof, the Promaster City has a total cargo capacity of 3,729 L, making it the best in its class. Width-wise, the interior measures at 48.4 inches from the wheels, which is wide enough to fit a 4×8 sheet of plywood. Without the wheels, it gives you even more space with a 60.4-inch capacity. You’ll notice throughout the Promaster City’s exterior that it’s brilliantly designed for everyday use and practicality. For example, its controls and latches make it easy and smooth to use its lightweight doors, which makes loading and unloading cargo easier than ever before. How so? Its 60/40 split-swing doors give you complete access to the rear, while the two sliding doors give you a 26-inch opening on each side of the van. You’ll never have to risk the dreaded “pivot” maneuver ever again to fit your precious cargo. 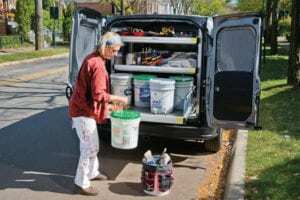 Once again, the Promaster City finds itself as one of the top-performing commercial vans on the market, with a payload capacity of 1,901 lbs (862 kg) on cargo van models and 1,713 lbs (777 kg) on wagon models, letting you store as much as you need it to. If you find yourself needing to tow additional weight, the Promaster City offers an overwhelming towing capacity of up to 2,000 lbs (907 kg) and a Gross Vehicle Weight Rating (GVWR) of 5,395 lbs (2,247 kg). 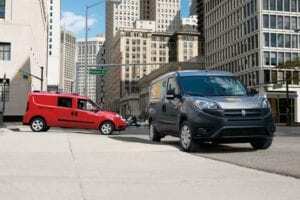 No matter what, the Promaster City can help you bring everything you need, both inside and out.